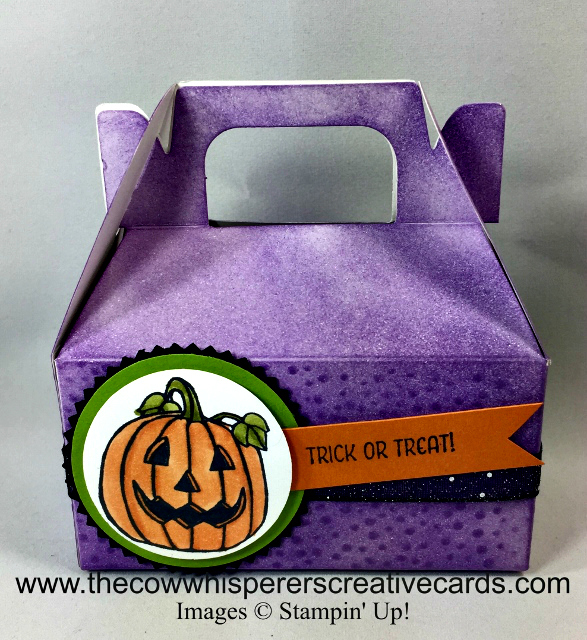 If you need some adorable goody boxes for halloween gifts, look no further than your Lustrous White Gable Boxes coupled with the Seasonal Chums Stamp Set. I'm sure you're wondering how I obtained the texture on this box in addition to how to a make it purple. Well, it's actually quite simple. 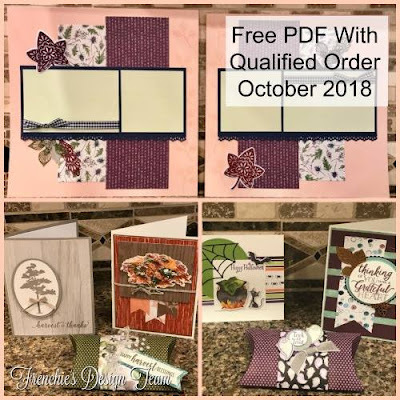 While the box is still flat, I ran it through my big shot (leaving the top flaps out) in my Softly Falling Embossing Folder. I then grabbed my Gorgeous Grape Ink Pad and my Sponge Brayer and got busy. 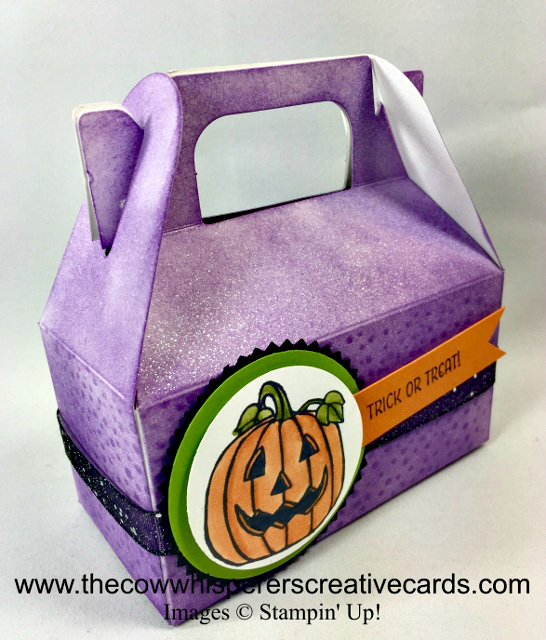 While I was letting the ink dry on the gable box, I grabbed my Thick Whisper White Cardstock, I stamped my jackalantern from the Seasonal Chums Stamp Set and colored it in with my Pumpkin Pie, Old Olive and Basic Black Light and Dark Stampin Blends Markers. I then punched him out with the 1 3/4" Circle Punch. I then cut a piece of Granny Apple Green Cardstock with the 2" Circle Punch and finished it off with Basic Black Cardstock punched with the Starburst Punch. The Granny Apple Green is adhered to the Basic Black and the Jackolantern is popped up with dimensionals. A 2 1/2" x 1/2" piece of Pumpin Pie was used for my greeting and I flagged the end, using a glue dot to adhere it under the Jackolantern piece. The beautiful shimmer ribbon you see is from the Holiday Catalog and is 3/8" Black Glittered Organdy Ribbon (trust me it's not just for Halloween). Eazy Peazy and Cute as PIE!!! Bring a smile to your kids, classmates, friends, family or coworkers with this adorable goody box.